We are excited to announce the winner of our stair design photo of the month! 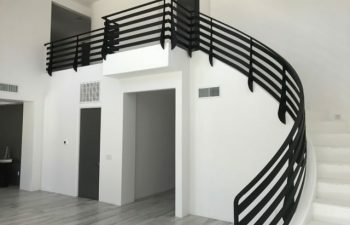 Augusts’ winner is a curved staircase with wrought iron railings that was installed for a residence in Tucscon, Arizona. Our Arizona team worked closely with the homeowner to create a fusion of modern and rustic styles for this curved staircase. 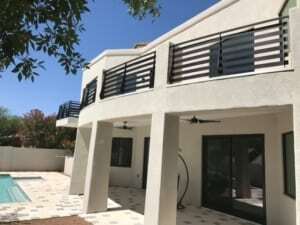 The black iron is utilized as a stark contrast to the light hues of the rest of the house in order to capture the attention of all who walk into the residence. These wrought iron railings are even used on the exterior of the house as a continuation of the staircase. Once the design phase is complete and all drawings and mockups have been approved by the client, our artisan welders will hand forge the handrail in our state-of-the-art metal fabrication facility. Our team will also pre-fit the ornamental metal handrails to the staircase prior to delivery and installation. This results in the best possible fit and finish, eliminating the need for messy welding and grinding at the jobsite. 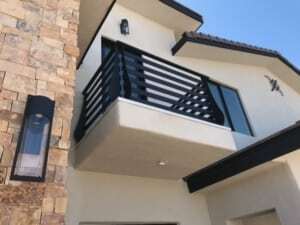 View our wrought iron stair railing and curved staircase gallery for additional inspiration photos and details regarding our products and offerings. From inspiration to installation our team is committed to designing and building the highest quality custom staircases. Our reputation speaks for itself and client satisfaction is our highest priority. Contact us today to discuss your next custom stairs project.